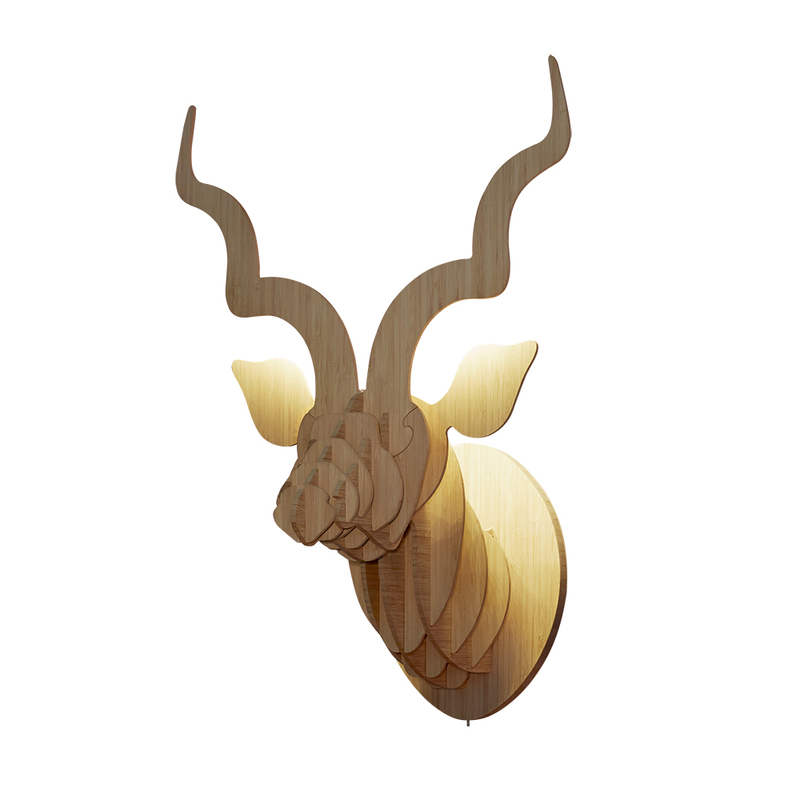 Animal head wall sculpture made from nature's wonder product bamboo. Each sculpture has a battery operated light attached to backlight the sculpture and create a soft glow on the wall. Brought to the UK from a design studio at the foot of Table Mountain. Joanna Orr of Head On Design creates beautiful, original modern African animal wall sulptures. A graceful take on traditional hunting trophies, they serve to celebrate the fragile beauty of our wildlife, but without the bloodshed. A big lover of nature, her products are made with our fragile earth in mind. , using only sustainable or recycled materials, as well as donating to wildlife conservation annually. What is so unique about this bamboo animal head wall sculpture? Besides being a striking addition to any interior space, they are extremely well made. Joanna also collaborates with various artists to produce a beautiful range of printed animal heads in themes that typically embrace South African trends, inspired by our natural as well as historical heritage. The sculptures are sold flat packed with clear, easy-to-follow assembly instructions. Enjoy creating this 3D wall art. Truly original gift for a conservationist, wildlife enthusiast or for a friend or family member who is ahead of the curve when it comes to interior design knowledge. What are the dimensions of the wall sculpture? Available in 3 unique, inspiring designs which are both eco and animal friendly. 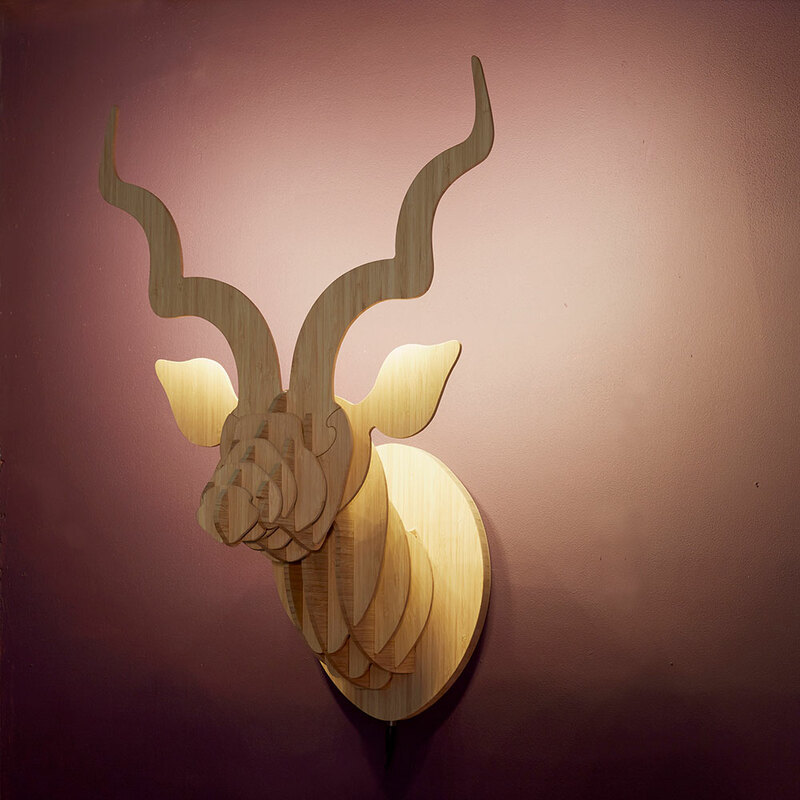 This elegant bamboo kudu head has been sourced from Head On Design in South Africa and offered for sale in the UK by AuraDecor Designs.